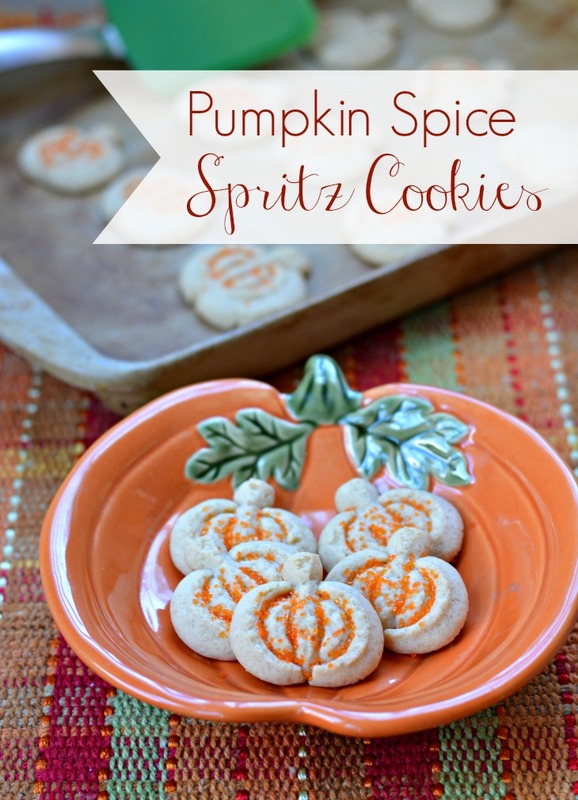 Pumpkin spice spritz cookie recipe are fun and easy to make with the OXO Cookie Press! 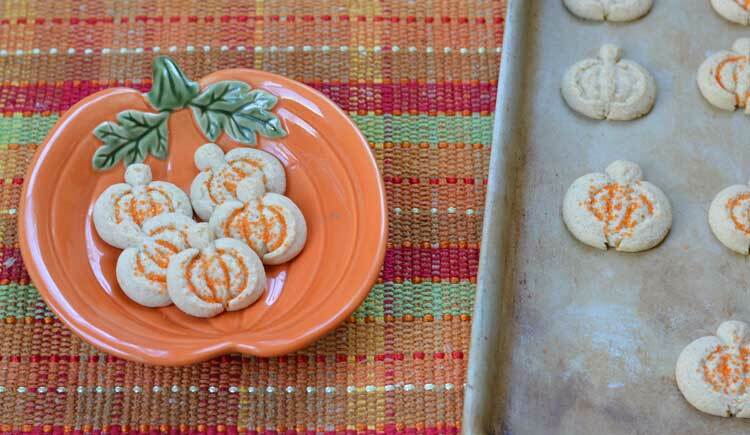 A simple butter cookie dough is spiced up with pumpkin flavors and then made in to pumpkin shaped cookies. Thank you to OXO for providing me with products for this post. When I was in high school I worked at a local hardware store. One of my favorite departments in the store was the household section. I loved stocking the shelves and take inventory of all the fun kitchen tools and appliances. My love of cooking and baking started early. Every once in a while I would purchase something for the kitchen and bring it home to try. One such item was a cookie press. 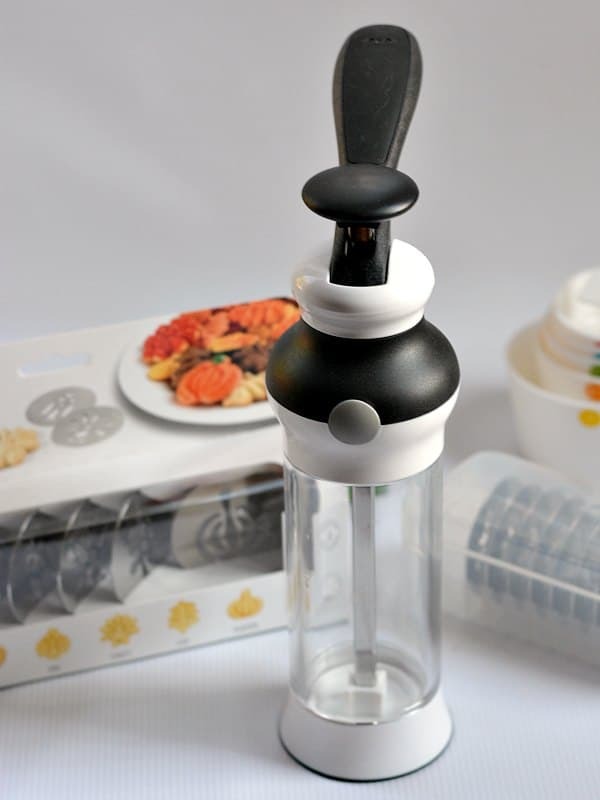 The cookie press seemed like such a fun idea and a quick way to make a lot of cookies. Unfortunately, I could never quite get it to work due to a serious lack of patience. 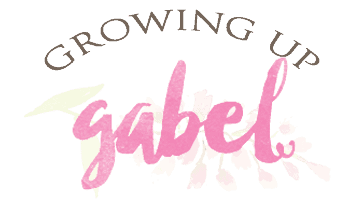 I decided that it was time to try again! This time I used the OXO Cookie Press. I wanted to try it out to see how it would work for the holiday cookie baking season. 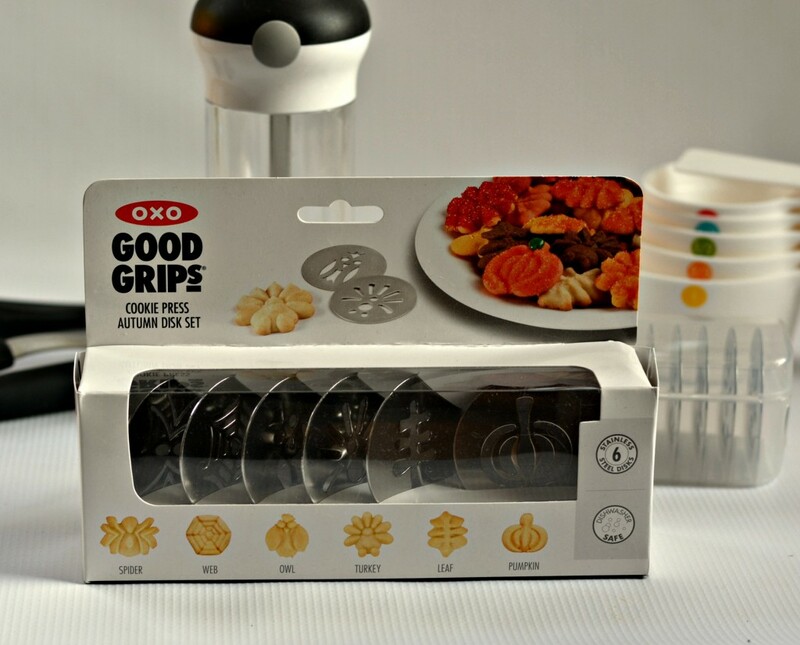 The cookie press comes with a set of disks already but I also purchased the OXO Cookie Press Autumn Disk Set so I'd be able to make some fall themed cookies. 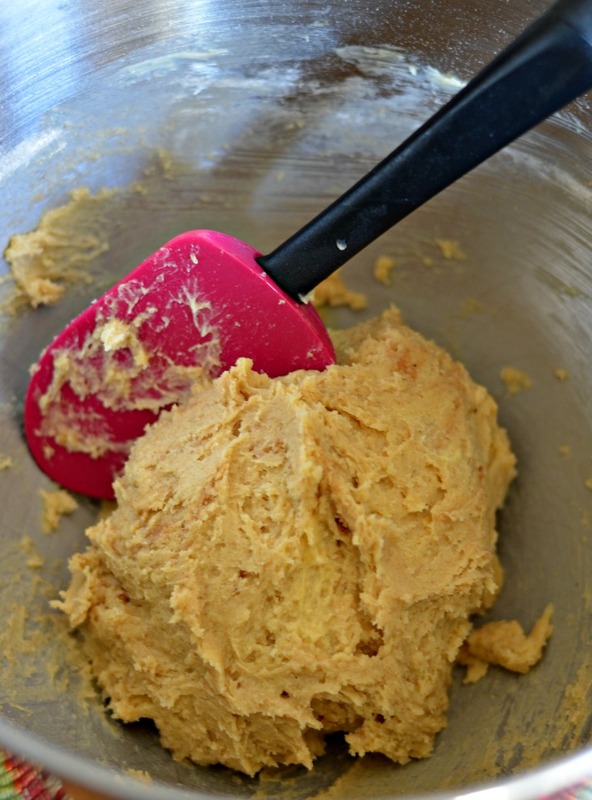 I really wanted to make a pumpkin flavored cookie, but I knew from researching that dough for cookie presses, spritz dough, is pretty specific. You can't really just pop any cookie dough in to the press. So I used the basic recipe from the book that came with the press and added in homemade pumpkin pie spice. It worked great! 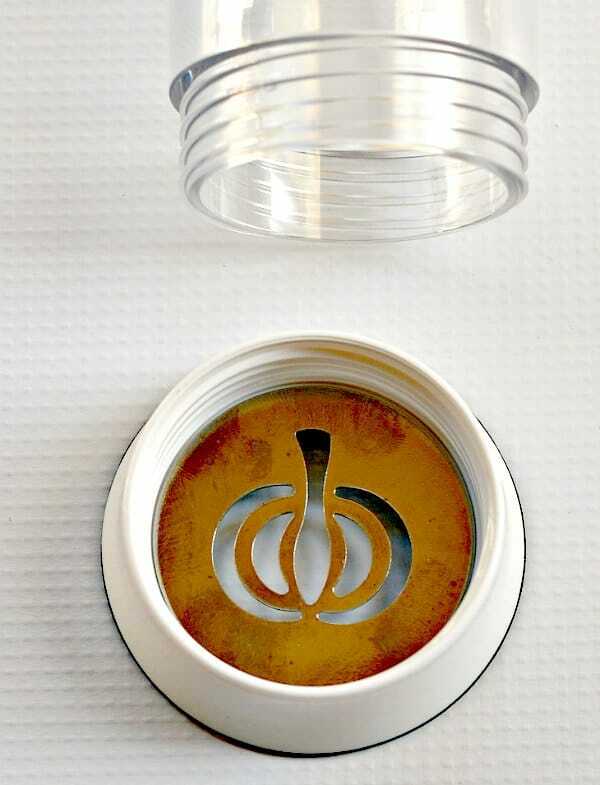 The cookie press is easy to use but it did take some playing around with it to figure out what worked – and even that changed when I switched disks. Fill the press with your dough. Almost every recipe I read said NOT to chill the dough so I didn't. You need the dough to stick to your baking sheet and that can be tricky. If the dough is cold, it won't want to stick as well. So use it right after you make it. I found that the cookies stuck better to aluminum cookie sheets than the stoneware sheets. 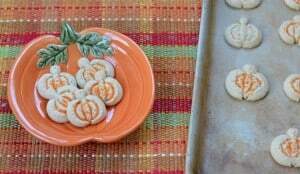 I used the pumpkin disc to make the cookies but switched in a few others to see how they worked. The discs are super easy to change out in the middle of making cookies, too. The first cookie will never turn out so just throw it back in the bowl. It took a bit of practice to figure out how much of a click I needed to get the cookie to stick to the sheet. Just be patient and keep practicing until you find the right amount of dough and clicks. Then bake and serve. Super easy once you get the hang of the cookie press. I used this cute little OXO cookie spatula to move the cookies off the baking sheets and to cooling racks. Cream together butter, sugar and salt until light and fluffy. This will take about 5 minutes. Beat in egg and vanilla extract until combined. Add flour and pumpkin pie spice. You can use as much or little of the spice as you like and adjust according to taste. Mix on low until flour is incorporated. 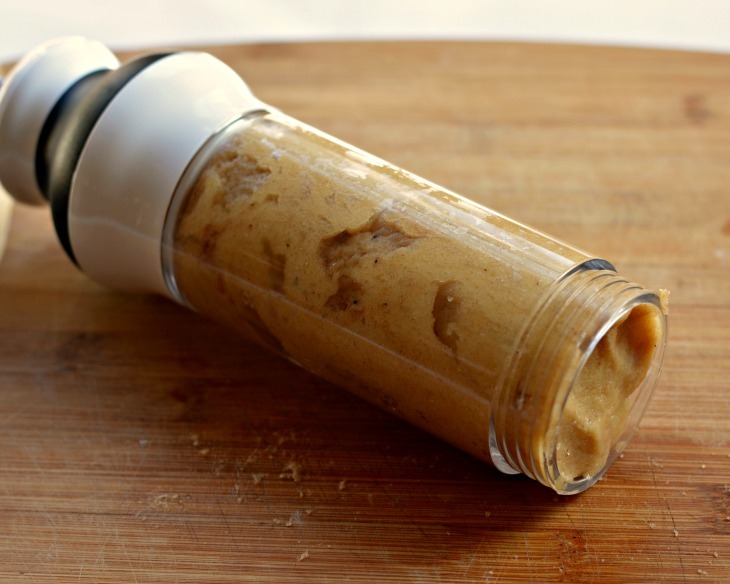 Fill OXO Cookie Press with cookie dough. Press dough on to ungreased baking sheets. You can put the cookies close together as they will not spread. Decorate with colored sugar, if desired. Bake for 8-10 minutes or until cookies are brown around the edges. I found 8 minutes was plenty of time. This post is sponsored by OXO and I was provided with products – except for the Autumn Disk Set, which I purchased on my own! This post also contains affiliate links. 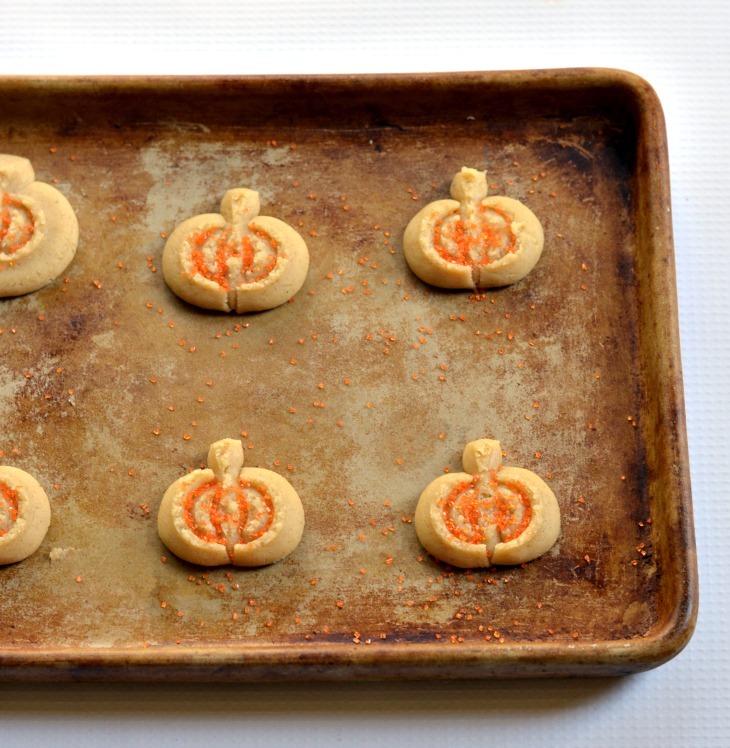 Your Pumpkin Cookies will be perfect for fall! 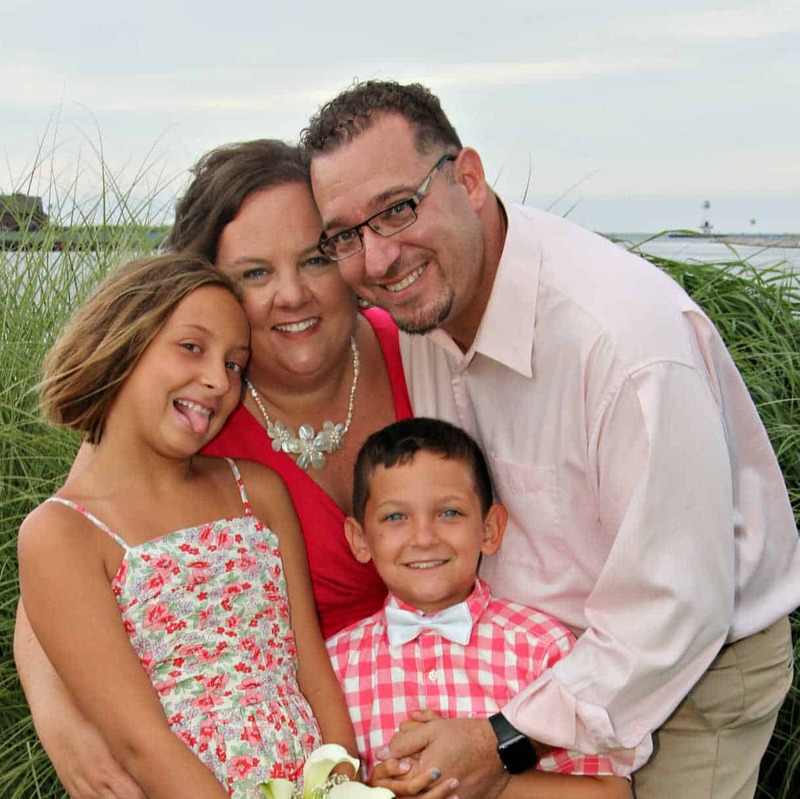 I really appreciate you sharing with us at Full Plate Thursday and hope you are having a safe and enjoyable weekend. How cute is that press!! I don’t have any but Christmas molds for my spritz gun, I would love some fall ones. That cookie press is SO cool & those cookies look so yummy! Thanks for linking up to this weeks Creative K Kids’ Tasty Tuesday – I can’t wait to see what you create next week! That cookies press is so clever! And what perfect little cookies it has created! 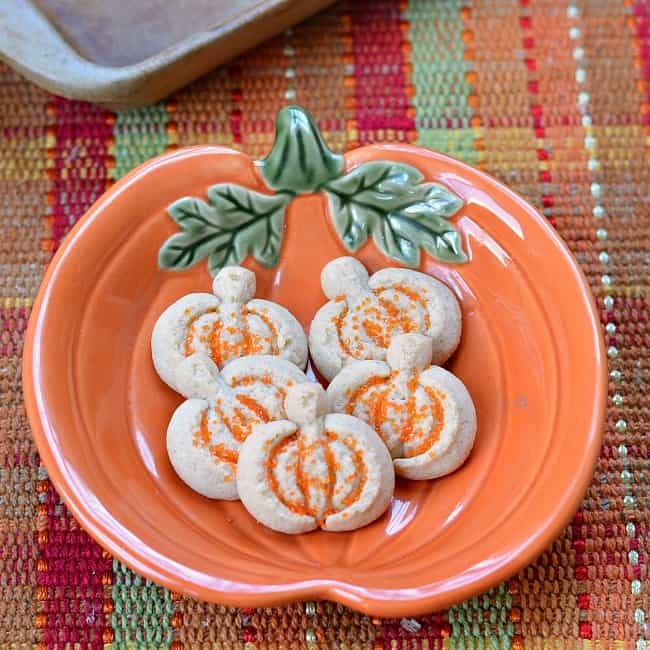 I love the pumpkin press cookie cutter and that pumpkin plate is adorable. I can’t wait to try these cookies. I could sure use a few of these now…love freshly baked cookies – thanks for sharing this with us at the #WWDParty. grandsons will be big enough to make cookies with me too. Thanks for the post and the lovely memories it brought back. Oh how fun and what lovely memories! I love that you still have your mom’s cookie press. I hope mine lasts that long and is handed down through the generations. Thank you so much for sharing! Spritz cookies bring back memories of my grandma. I think I need to make some with my kids. Love your idea of adding pumpkin pie spice! What’s the best way to add the colored sugar? I just sprinkled it on over the cookies before baking them. Have fun! These are really cute autumn shapes! I usually only pull out my spritz cookie gun at christmas time. I might have to buy these and enjoy some autumn cookies! I hope I can find them around here. Thanks for the info! I know! I LOVE the fall disk set – so fun!